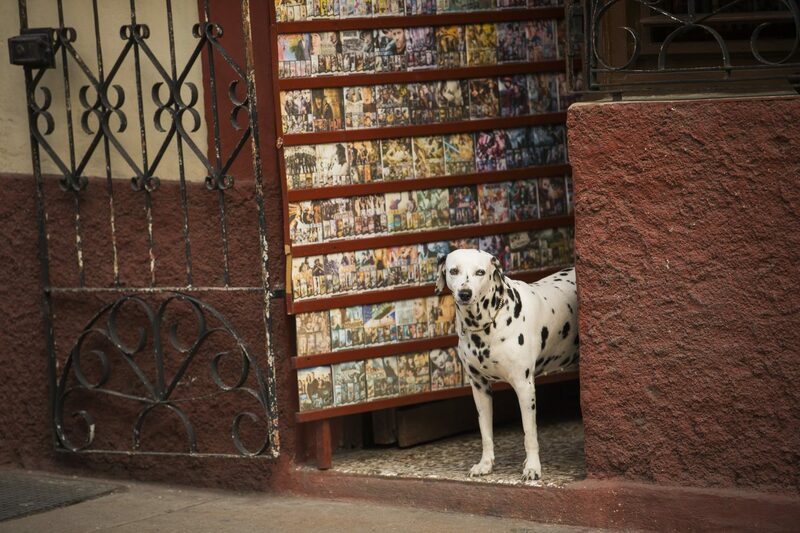 I’ve come to Matanzas, a historic Cuban city between Havana and the beach resort of Varadero, for a little beach break in a historic, idyllic town with plenty of bayside colonial charm. But first, I want to see some baseball. 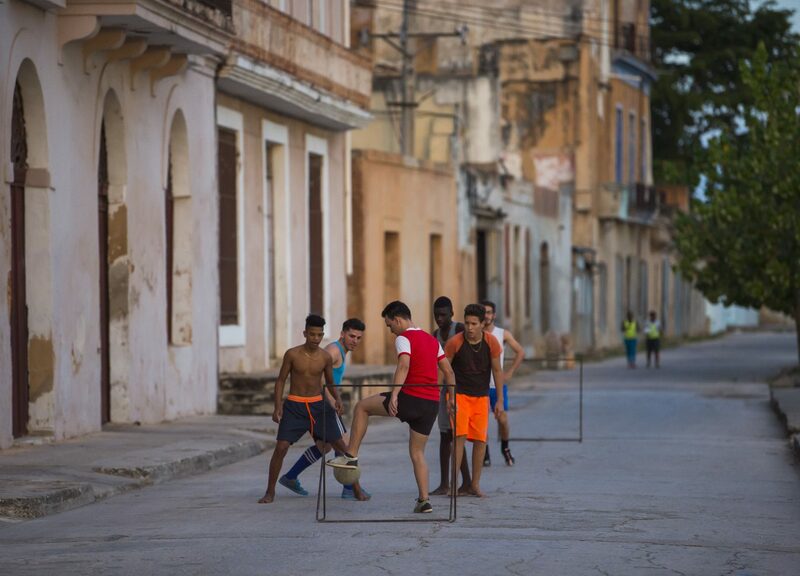 Baseball is big in Cuba. 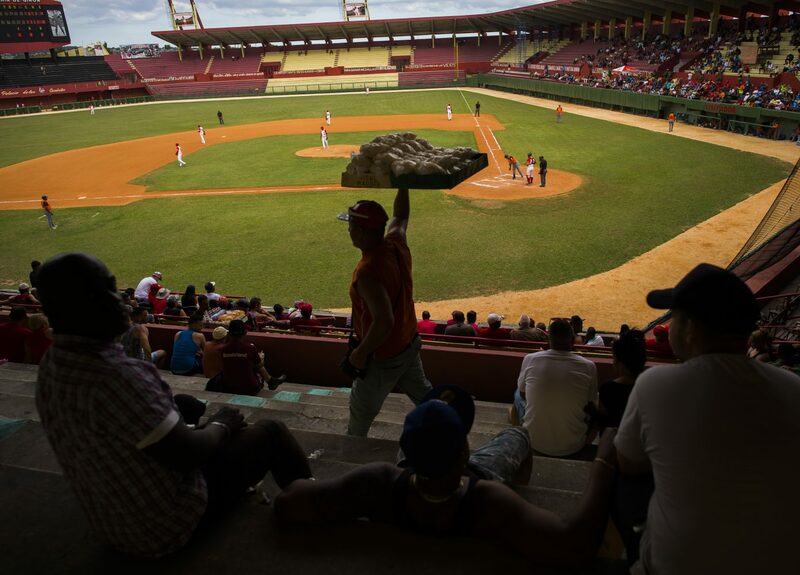 After being introduced by Cuban students back from a U.S. visit in the 1860s, the first official baseball game in Cuba happened here in 1874. (Sadly the home team lost 51-9.) Four years later, the national league began as a politicized alternative to Spanish rulers. Today, the Matanzas team plays as the Cocodrilos, with games held from October through May. After dumping my bag in my room, I head out. 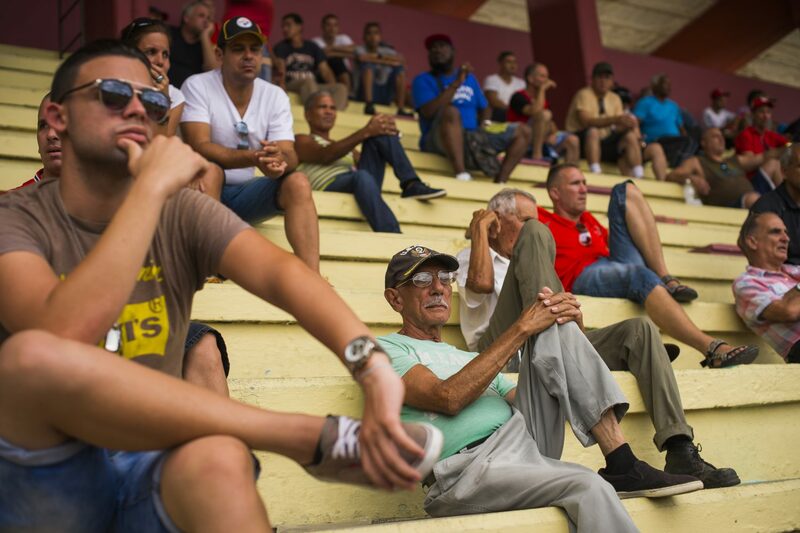 The red-and-cream Estadio Victoria de Giron sports a faded retro futuristic look, but one with a horse cart passing by. At first the entrance is unclear, so I follow my nose. Around the left side, half-chickens and pork filets sizzle on barbecue grills. There I find an open gate and buy a ticket for CUC$1 (convertible pesos, paired with the US dollar). Looming over central field, the scoreboard features a blurry photo of Fidel Castro. 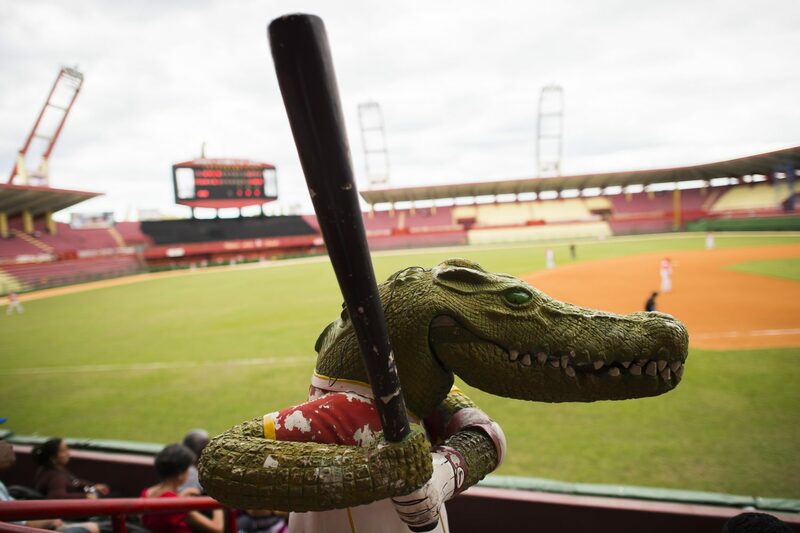 It shows that the Cocodrilos are already up 3-0 on Villa Clara in the second inning. As the stadium is only 10 percent full, I decide to make half-inning seating changes for a mix of viewpoints. By a life-size crocodile figurine, I briefly sit by a woman blaring a whistle nonstop. Standing above the outfield bullpen, an opposing player asks me for my camisa (shirt). Passing a back stairwell by first base, I accidentally spy on a security guard making out with a bleached blonde woman. And the Cocodrilos win the game. 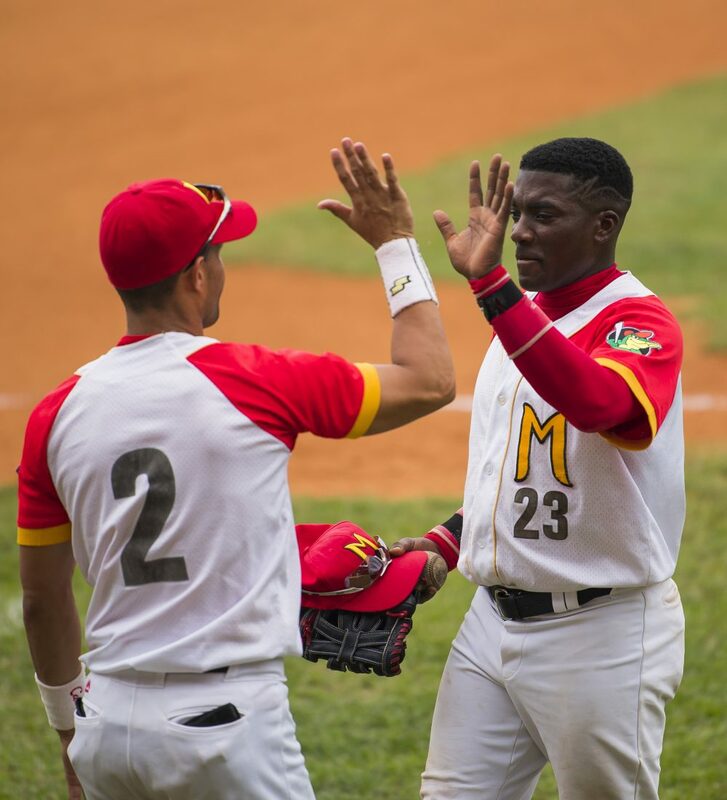 The Matanzas Cocodrilos are a baseball team in the Cuban National Series. Based in Matanzas Province, the team plays home games at the Estadio Victoria de Girn. Beyond baseball, Matanzas has a deep history to explore. The Spanish founded the city in 1693 at the mouth of two narrow rivers at a long namesake bay. 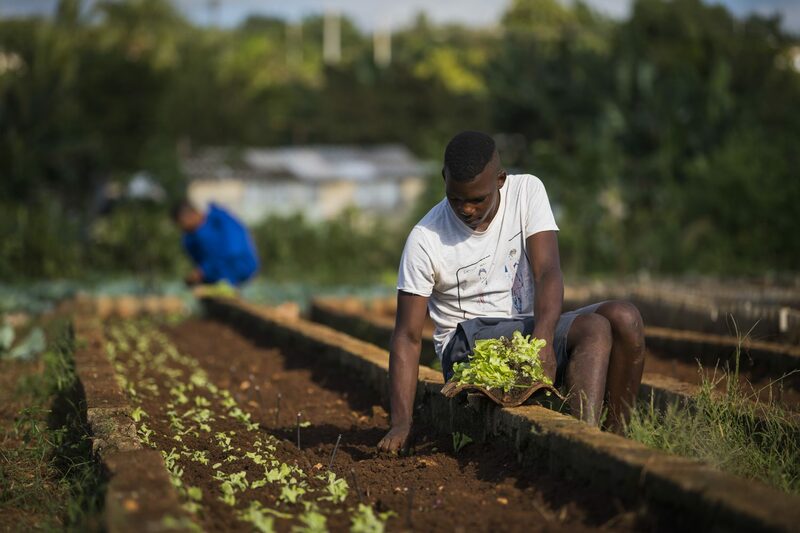 It quickly became a key center for the slave trade then, as a result, Santería, a still-active folk religion linked with West African traditions. 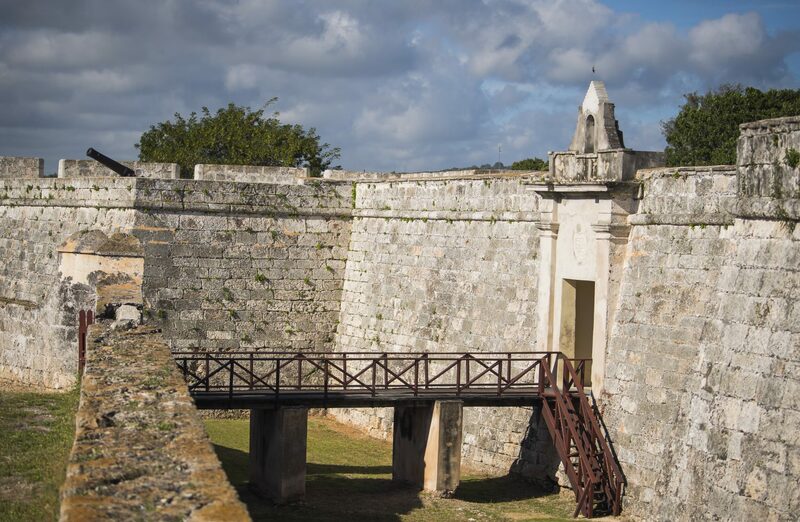 The Castillo de San Severino, a low-walled fortress that dates to 1793, tackles both subjects. “This is the only museum in Cuba that covers slavery,” says Teracita, the museum guide who sold me my $2 ticket. Ugly black shackles, left over from the period, sit on a small stand on the tiled floor. A nearby sign lists all slave revolts in Cuban history from 1825 to 1879; nearly all were at sugar mills. The next room has mannequins dressed in colorful Orisha (Nigerian spirits or saints) outfits that are linked with Santería. Next I take on central Matanzas by foot. 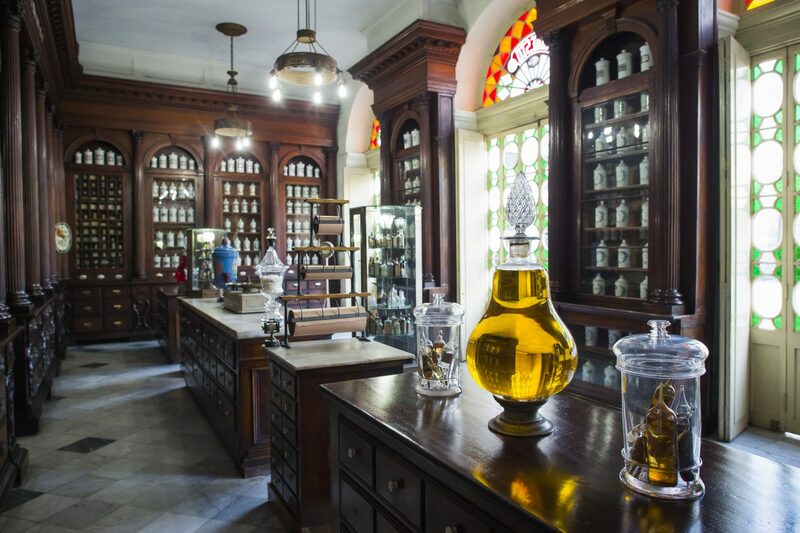 Facing Parque Libertad, the Museo Farmacéutico is the world’s “only original and complete French pharmacy of the … 19th century.” Towering shelves of color-coded bottles fill a couple rooms of the pharmacy that was open 1882 to 1964. 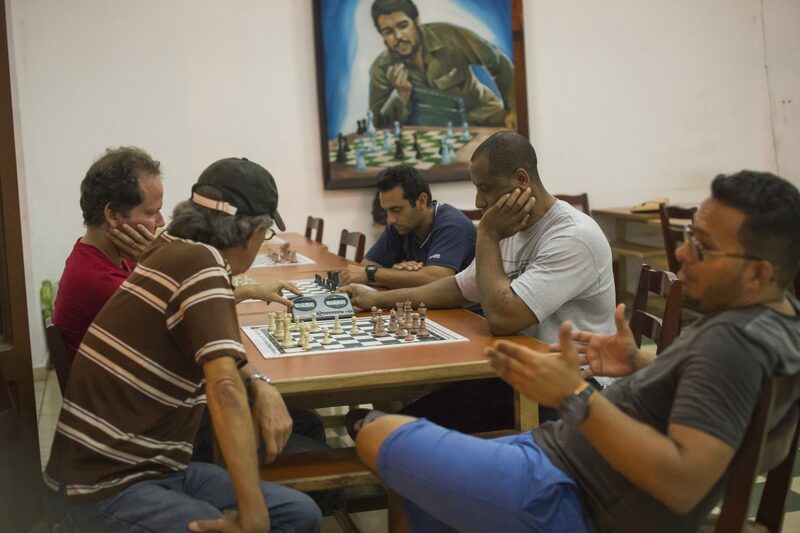 On narrow sidewalks of backstreets, I pass a hand-painted bicycle parking sign, and peek into a chess club with a Che Guevara mural facing a few men watching a match in progress. In an open-front gallery, an artist offers me a “happy new year” card he just made. 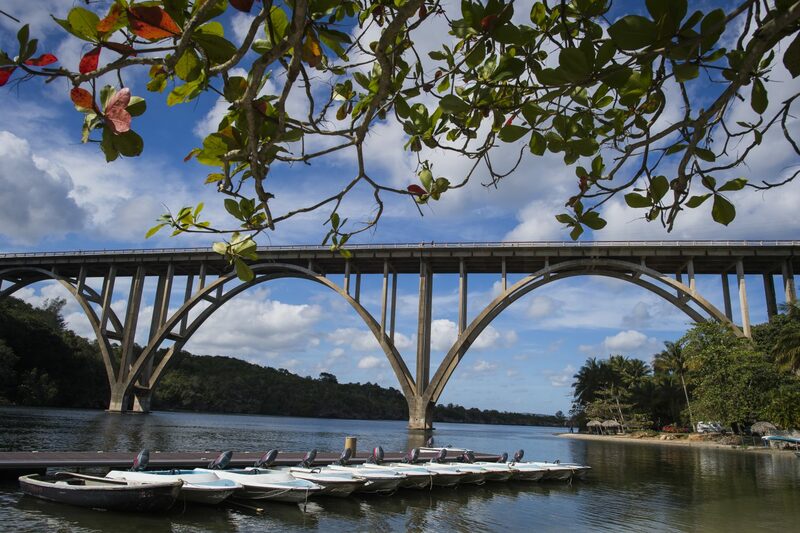 Much of Matanzas’ casual charm is linked to its nickname “city of bridges,” as many cross its two rivers. 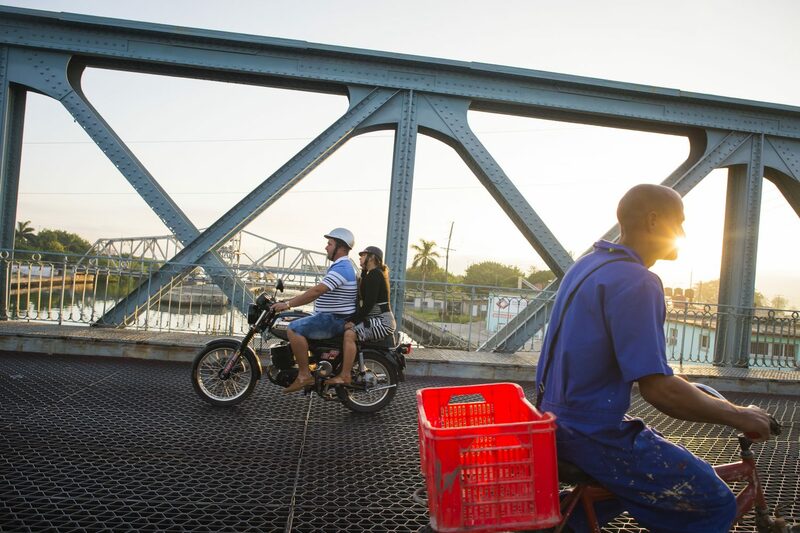 I reach the Puente Calixto Garcia, a steel bridge built in 1899. 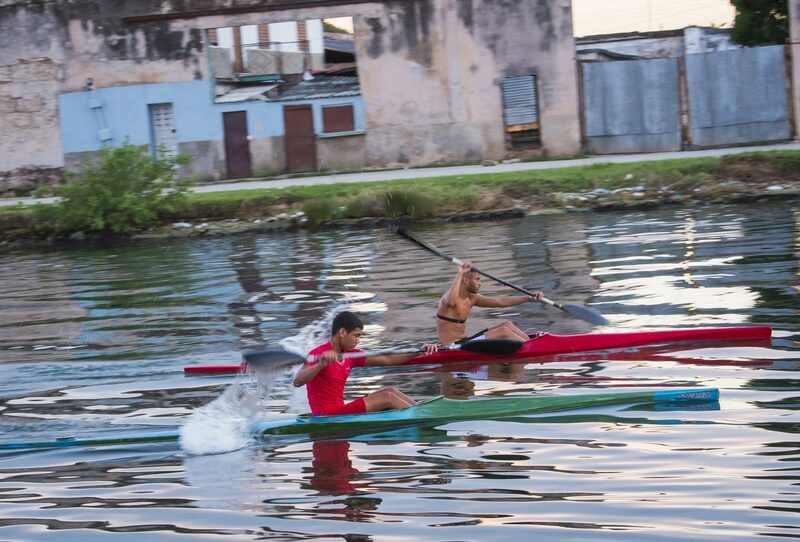 I stop halfway across to watch a teen kayak team paddle along the Río San Juan below. Nearby is Ediciones Vigía, a bookstore/workshop set in a colonial corner building on tiny Plaza Vigía. A half-dozen middle-aged women sit at big tables, cutting, pasting, stamping editions of unique, handmade books. 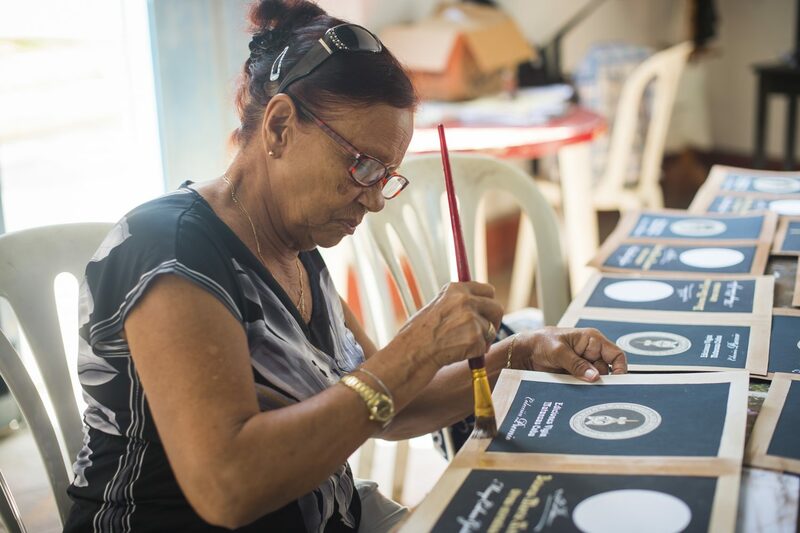 Since 1985, they create editions of 200 books, often featuring colorful decoupage covers for works by local poets (one is of a poem Che wrote for Castro; another is by Charles Bukowski). 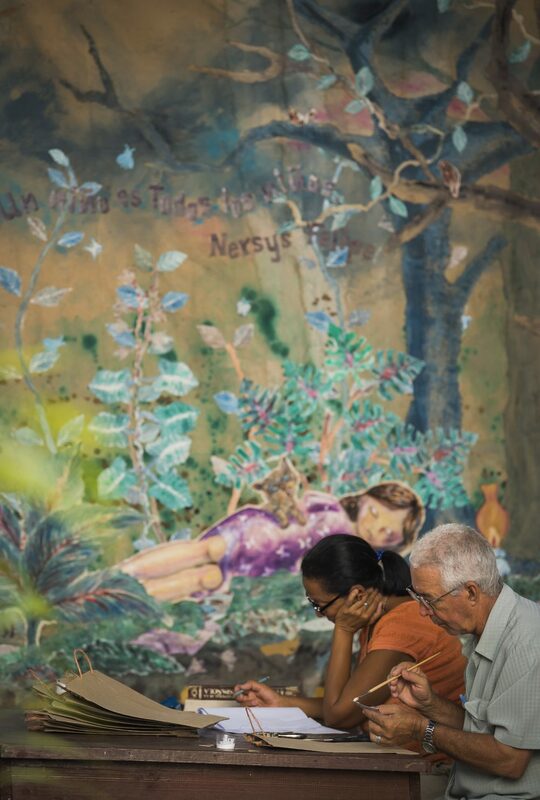 I mention to one woman, a grandmother who hums as she glues on thick paper covers to a new book, what an arty town Matanzas seems to be. 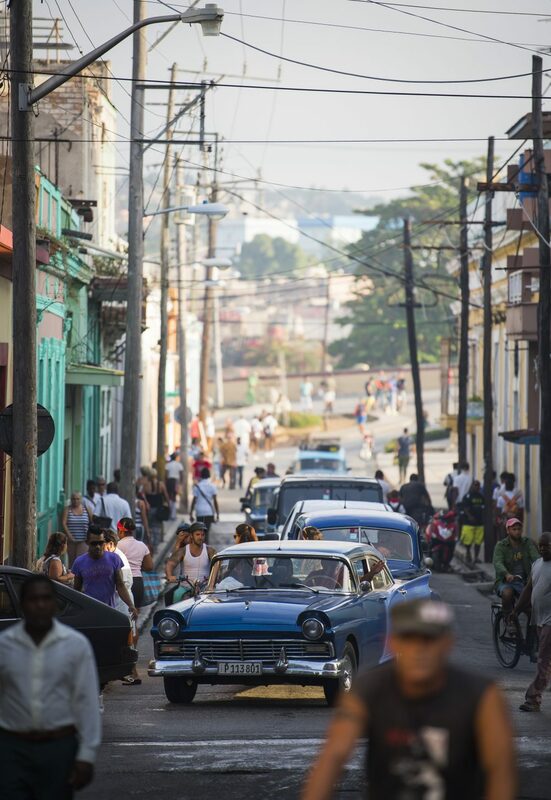 The local fleet of taxis, as elsewhere in Cuba, is a mix of Soviet cars and left-over American classics from the 1950s. Joined by photographer Ingrid Barrentine, we hire a 1980 Moskvitch taxi painted emerald green to reach a couple nearby sites. But when I mention to my driver Junel that I once drove a Moskvitch around Bulgaria, he insists I sit up front. He leads us on back roads along the narrow bay to green farmlands where we arrive to Bellamar Caves. 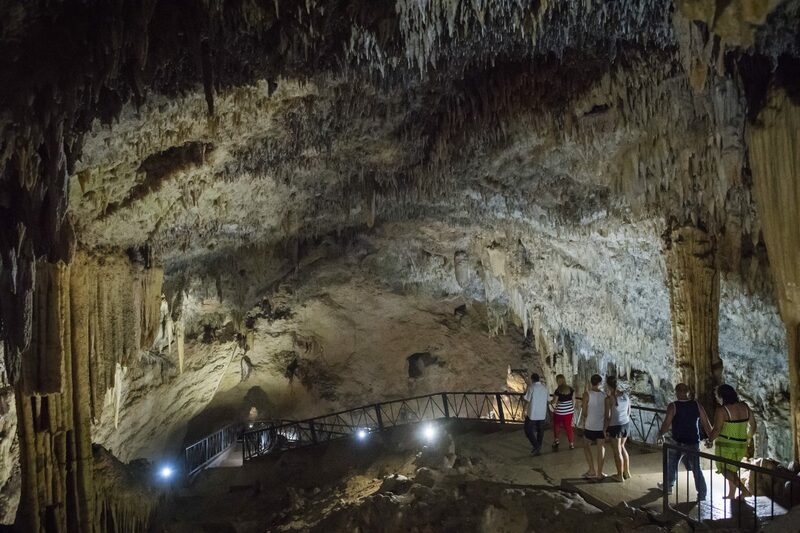 The short bilingual tour of the 25-million year old calcified system takes in crystal tunnels, “fountain of youth” pools, and animated figures made out (with a squint) in stalagmites and stalactites. It’s been a big tourist attraction since its discovery by a Chinese farmer in 1861. A fifteen-minute drive farther northeast is Río Canímar, where you can hire boats to ride past mangroves, palms, bamboo trees and rising green hills. 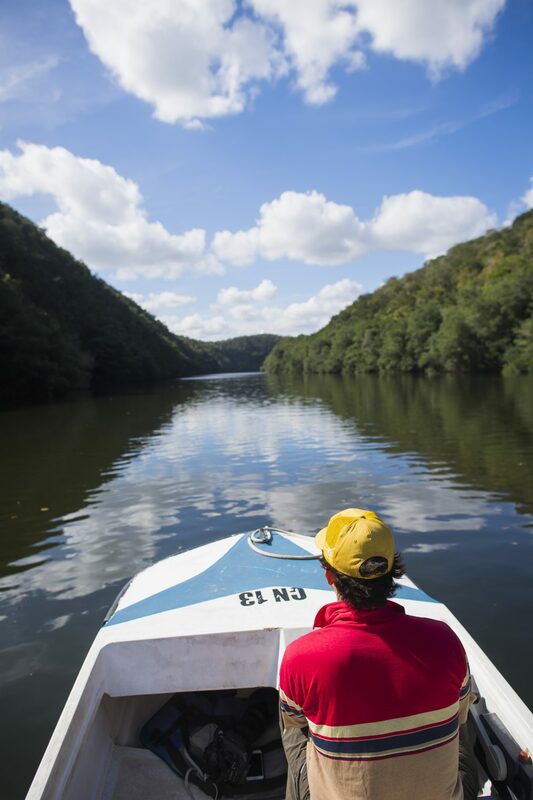 We ask about a ride up the river (CUC$35 for the boat), and a young man jumps into the open boat. What he does next surprises me. “This is how you start the motor,” he says pulling the motor chord. “And here’s how you turn it off.” He shows me how to steer and back up. “OK?,” he asks, getting out. Wait, I’m driving this thing? Having never really driven a boat before, I’m uneasy at first, but soon am happily gliding at full throttle on the twisting river. I slow up when we pass fishers, sitting in black inner tubes in quiet bends. When we reach an end station eight miles or so upriver, I U-turn and ride back. At a beach back on shore, I see a group of local adults and kids dancing to a blaring boom box around a full pig pierced by a long wood stake. And within a minute, Ingrid and I are in the group, with a cold bottle of Cristal beer each in our hands, and an invitation to return a few hours later to eat fresh roasted pork. People say Varadero’s 10 miles of white sand, a 45-minute drive away, is like “Cuba’s Cancun.” And, as beaches go, it’s as nice as it gets. 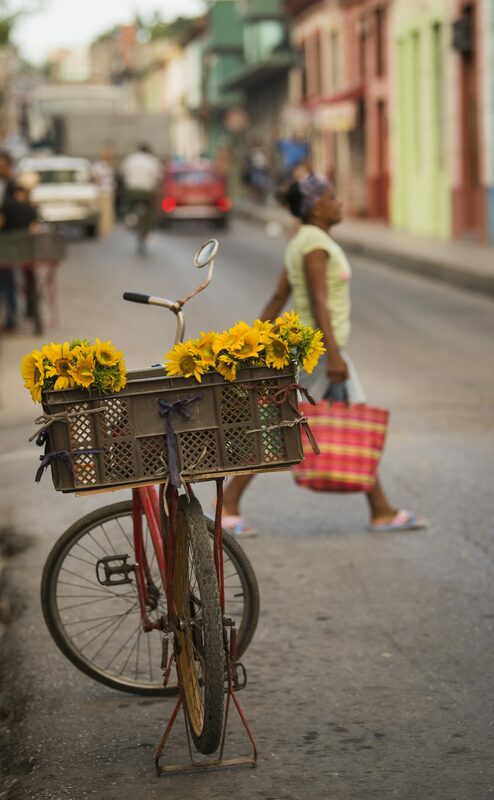 But it takes Matanzas to get a dose of Cuba. I stayed on Parque Libertad at the Hotel Velazco, a recently restored hotel that dates from 1902 (you can book it online, paying euros, here. There are several restaurants and bars around the center. The balcony seats on the Restaurante Romántico San Severino (Calle 290 between Calles 279 & 283) are a nice spot for dinner, but I preferred the more local scene, and cheap pizzas, at Plaza la Vigía, a century-old spot with towering ceilings. You can find taxis on Parque Libertad; I never was overcharged (much). Robert Reid is a travel writer based in Portland, Oregon, whose writings have appeared in the New York Times and Wall Street Journal. He’s been the spokesperson for Lonely Planet, appearing on CNN, NBC’s Today Show and NPR to discuss travel trends. He’s currently the Digital Nomad for National Geographic Traveler. Photos by Ingrid Barrentine. 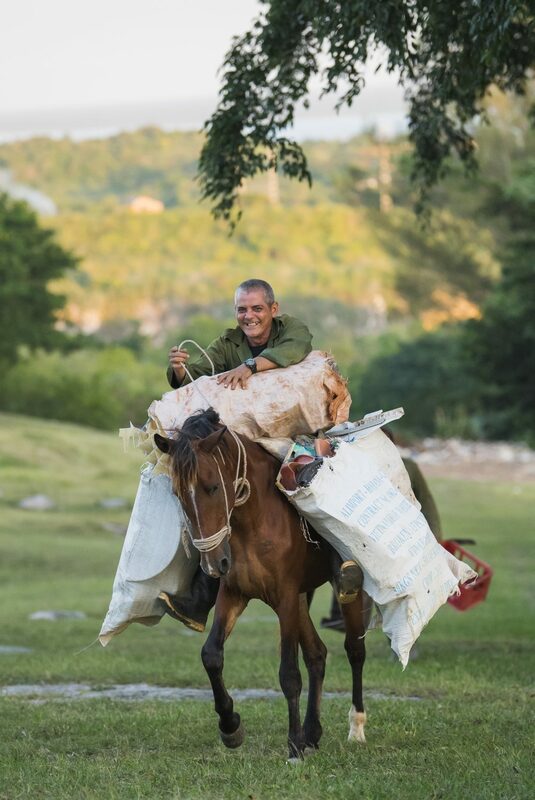 1 comment on "Matanzas: Cuba’s off-beach home run"
If you cannot afford to travel hop aboard Alaska Airlines with the global adventures.